My oldest son discovered a love of soccer at an early age. These days he lives in breathes the game! He practices 3 times a week with his team and has games or tournaments on most weekends. If you have a kid in club soccer you know this life! He actually has his own instagram account (@SoCalSoccerKid) – managed by Mom and Dad of course. Feel free to follow along if you are interested in seeing his soccer skills! 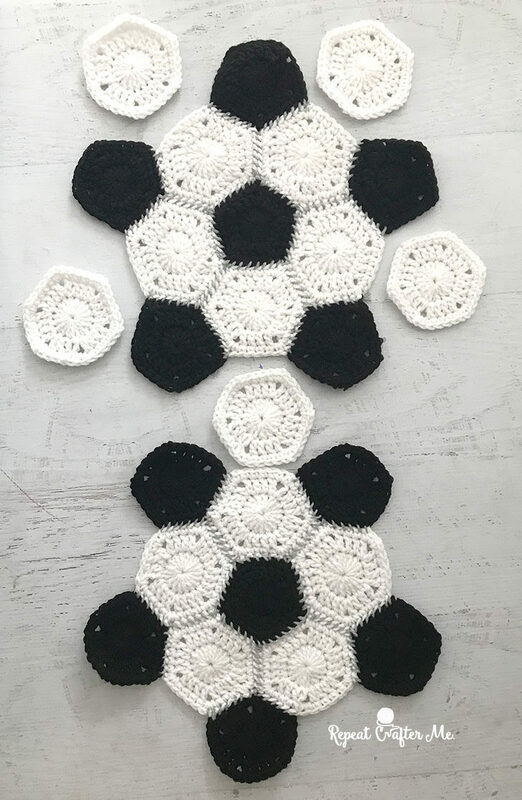 I’ve been wanting to crochet him something soccer-themed for awhile and I could see his excitement when I started crocheting little black pentagons and white hexagons! The result is a Crochet Soccer Ball that is perfect to use as a pillow, room decor, or for indoor play! It’s funny how these shapes come together. A soccer ball is made up of pentagons (the 5-sided black shapes) and hexagons (the 6-sided white shapes). And when you stitch these together, the roundness automatically takes shape! – Optional: Bernat Super Value in Soft Grey for the stitches. – Poly-fil Fiber Stuffing. You will need a full bag. Round 3: SC + chain 1 + SC in first chain space, SC in next 4, SC + chain 1 + SC in next chain space, repeat around, join, fasten off and weave in ends. Now start stitching the Pentagons and Hexagons together! I used gray yarn (you can choose to back or white as well for your seams) and use your tapestry needle and the whip stitch to sew the edges. Start with a black pentagon in the center and stitch 5 white hexagons around it. Now add in 5 more black pentagons like in the picture below. Make 2 of these shapes. Once you have two top and bottom of your soccer ball, you will add in the remaining white hexagons to close the two pieces together (note that you will have more than 5 leftover hexagons – they rest aren’t pictured below). The ball will take form all on it’s own! Stuff generously with poly-fil before closing! I didn’t find that my polyfil was coming out of the crochet stitches but if you are uncomfortable with this, you could also use a round pillow form to stuff it. If you make this Crochet Soccer Ball please tag me on social media using the hashtag #RepeatCrafterMe. I would love to see my fellow soccer fans! Dear writer! Many thanks for being there and sharing so seriously content. There is someone who appreciate it and declare thank you so much! In my viewpoint, not countless bloggers have so numerous information to create new, worthwhile articles. Thanks for creating it and I want you did not lose the inspiration to make the unique ones! I completely accept with the previous reader. I know the awesome determination and good suggestions are great foundation to compose premium excellence material. I have regularly thought about how to prepare top excellence content and release them on the site. Today I should say that the work isn’t for me. I keep it for professional people. OMG!!!! This is my new favorite recipe. Thank you so much for sharing. What’s the final size of your pentagon? wow, the ball is woven creatively and beautifully, thank you for sharing. Woww amazing. I never think about create a ball by wool. So my son can play in home without breaking things. My cats surely will love it too. Does anyone know the required size of the hexagon & pentagon? These kind of talent are god gifted you should check the official site where you get some opportunity for your potential. Do you think it would work ok to slip stitch the pieces together instead if sewing? Maybe in the back looks so it is flat? Hi ! A really great design, thank you. I’m having a great deal of trouble putting it all together. My lovely daughter feels it may be to do with the way I’m placing the black Pentagon’s. The pattern is not clear about which sides need to be placed against the white. I’d very appreciate some help, it’s a Christmas gift for my grandson. I’m disabled and my dexterity is not as it was. I’m looking forward to trying this out. But I have one concern. Does the filling ever spill out of the holes on the corners of the pentagons?